John J. Montgomery Elementary School was built in 1975. It is located in a community near the foothills in southeast San Jose. We take pride in the appearance of our school, and there is adequate classroom space for all students. Our students take responsibility for maintaining a clean school and safe environment. In 1995 and 2000, we were selected as one of the California Distinguished Schools. Again, we increased our Academic Performance Index (API) score and met the state growth target. We were eligible to receive funds through the Governor’s Performance Award Program. We are proud of the quality programs we offer and encourage students to be lifelong learners. We, the staff of John J. Montgomery School, are committed to the process of educating the whole child - academically, socially, physically, and emotionally. We value the individual and cultural differences that each child brings to our campus. All students have equal access to a rigorous curriculum with high expectations necessary for successful transition from one grade to the next. All students are responsible for their learning and behavior within a safe school community. All students have opportunities to develop both technical and critical thinking skills to make them productive participants in the global community. Montgomery Elementary School is committed to empowering all students to be successful learners and valiant problem solvers. We provide a safe environment in which every child develops confidence and experiences success. We embrace our motto “Knowledge is Power” and believe in the ability of every child to become an inspired life-long learner. Evergreen School District, located in the City of San Jose, is comprised of fifteen elementary schools and three middle schools. Once a small farming city, San Jose became a magnet for suburban newcomers between the 1960s and the 1990s, and is now the third largest city in California. The city is located in Silicon Valley, at the southern end of the San Francisco Bay Area, and is home to more than 973,000 residents. Montgomery Elementary School is located on the western side of the district’s borders. In the 2014-2015 school year, the school serves 620 students in grades pre-K through 6 on a traditional calendar schedule. The school provides a family-oriented, nurturing, and safe place for students to learn, grow, and develop intellectually. Teachers, staff, and administrators continue to act on the principle that students come first. John J. Montgomery Elementary School in San Jose is named after John Joseph Montgomery (February 15, 1858 – October 31, 1911) an American inventor, physicist, engineer, and professor at Santa Clara College in Santa Clara, California. He is best known for his invention of controlled heavier-than-air flying machines. While testing a control system on a monoplane glider called The Evergreen, named after the region where flight tests occurred on the hillsides east of San Jose, California, he encountered turbulence strong enough to cause his plane to stall. Montgomery died at the site due to his injuries in the resulting crash. This hillside, now known as Montgomery Hill, is located just behind Evergreen Valley College. Our school is one of five schools in the state named after this famous Californian. 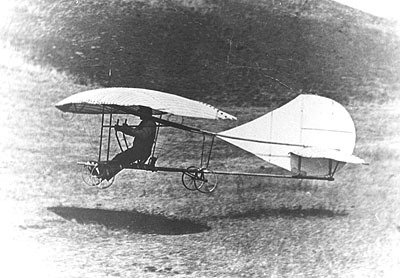 John J. Montgomery landing The Evergreen monoplane glider in October, 1911.